If you want to truly indulge in Nepali cuisine, you will have to put hundreds of miles under your heels, traversing the entire length and breadth of this beautiful Himalayan country. Simply because the culinary landscape of a diverse nation like ours, where multiple ethnicity and cultures have been thriving for centuries, is bound to be unique, rich and above else disparate. That is not to say, however, that Nepali ethnic cuisines not delectable. They are, and most importantly, you don't necessarily have to develop a palate for majority of them. Take the traditional Thakali food for instance. It is one of those subsets in Nepali cuisine, which promptly triggers an irresistible craving, with its own unique flavours that originally come from Thak-khola village, in the upper region of Kali Gandaki Gorge. Good thing is I don't have to travel all the way there to gratify my Thakali cravings. I just have to make my way to Tangaal Chatta Ganesh. 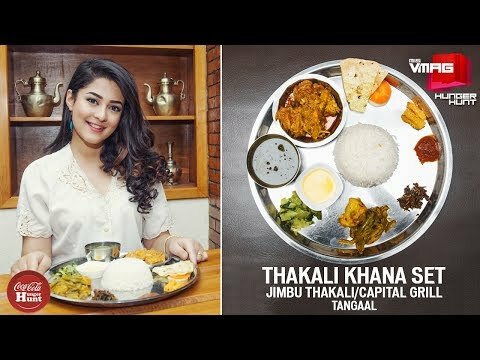 Next to it is Jimbu Thakali, where expert chefs churn out delicious Thakali dishes, the centrepiece of which happens to be the Thakali meal.